Are you looking for a fun New Year’s resolution for you and your family? Then why not learn French in 2017! With our wide range of French classes for both adults and children, we really do have a course for everyone – whether you are completely new to learning French, want to pick up where you left off, or simply want to encourage your child to learn French or study for an exam. We run programs from beginner level through to advanced, so you can choose to start by learning the very basics of French conversation, and progress right the way through to being fluent! Our classes are always taught in fun, interactive ways by our qualified native French teachers, and you can record the progress you make with the certificates we award at the end of every course. We run adult classes on weekdays and at weekends, so you can easily fit them into your busy schedule. Across all our programs we believe it’s important to focus on developing your French conversation skills, but we’ll also spend time on your listening, reading, writing and grammar skills as you progress. Confused about which course to sign up for? Don’t worry! We can help find the best program for you through our free level test. Whether you start at beginner level 1, intermediate or advanced, you’ll know you’re on the right track from the very beginning! Since joining French Studio last year I feel like I have made so much more progress! I have already completed Beginner Levels 1 and 2 and will start Level 3 in January. I always look forward to my lessons every week and find the interactive way the classes are taught very entertaining. My confidence has definitely improved and I have already set myself a challenge to complete the Intermediate Levels in 2016! Thank you French Studio! Introduce your child to the French language and culture through our interactive group classes specifically designed for 5 to 7 year olds. 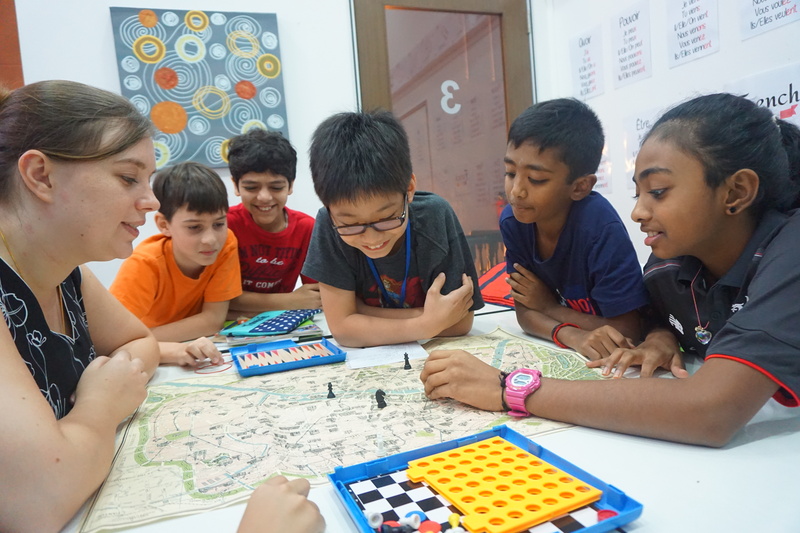 We’ll focus on developing their vocabulary and will encourage them to start speaking and listening in French, through playing games, singing songs and fun group activities. We’ll also start to teach them the basics of reading and writing in French. Beginner and Intermediate classes are available. Suitable for children studying French in Lieu of Mother Tongue. 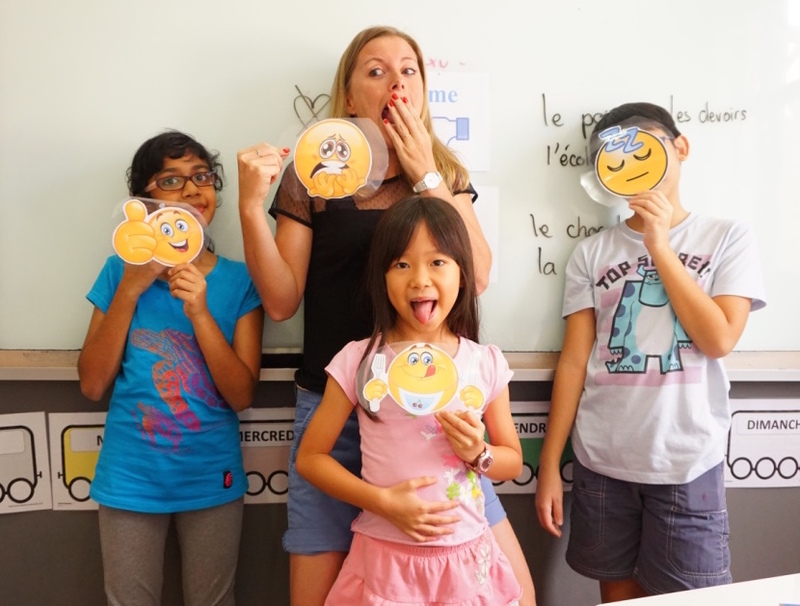 When we moved to Singapore we felt it was important for our child to continue learning French, as they had been having lessons at school in the UK. We found French Studio through a write up in a magazine and the style of their classes seemed the perfect choice for us. 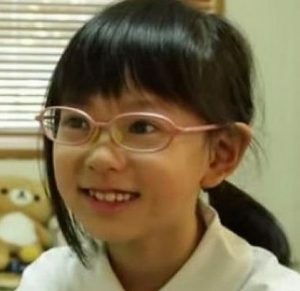 We enrolled our 6-year-old daughter and after her first lesson she came home full of enthusiasm, singing a French song she had learnt in class! Since then we have seen her play games in French with her new friends and bring home lots of French inspired arts and crafts. Her confidence has bloomed and we are so happy we chose French Studio. Thank you. 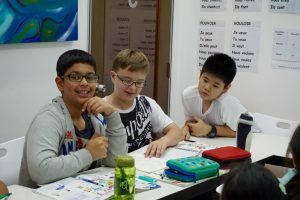 These classes are suitable for all primary school students, including those learning French in lieu of Mother Tongue*. The program we follow has been approved by the Ministry of Education (MOE) and we are MOE registered. Our aim is for your child to gain confidence in speaking French, so all our classes are taught in a relaxed, friendly atmosphere through games, songs, crafts, stories and group activities. We’ll also incorporate listening, reading and writing tasks to help your child progress. Classes are held during the week and at weekends, and range from Beginner level to Advanced. 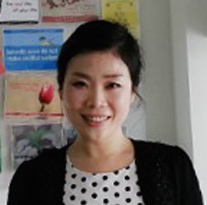 If your child is in a local school in Singapore, they will be required to study Chinese as part of the Ministry of Education’s Mother Tongue Language Policy. However they can choose to learn French instead! Click here for more information. These classes are held in small groups and are specifically designed for students at secondary school level who are preparing for their ‘O’ Level or ‘A’ Level exams. Our program has been approved by the Ministry of Education (MOE) and we follow the exact same syllabus as the Ministry of Education Learning Centre. We even incorporate past MOE exam papers and hold mock tests to ensure your child achieves the best results they can! I just want to thank French Studio for their help and guidance when we applied to the Ministry of Education for our son to study French in lieu of Mother Tongue. We found your support invaluable and it was great to find a French school that was MOE registered and follows an MOE program. Our son really enjoys his lessons with you and it has made a big difference to his confidence at school. I would definitely recommend French Studio to other parents. Whether you and your family want to learn French just for fun, to open up more career opportunities, or to achieve excellent results in an exam, French Studio has the perfect course for you! If you have any queries, then please get in touch with us. We look forward to meeting you in 2017.